Abu Abdullah Muhammad Ibn Batuta ( Arabic: أبو عبد الله محمد ابن بطوطة) (born February 24, 1304; year of death uncertain, possibly 1368 or 1377) was a Moroccan Berber Sunni Islamic scholar and jurisprudent from the Maliki Madhhab (a school of Fiqh, or Sunni Islamic law), and at times a Qadi or judge. However, he is best known as an extensive traveler or explorer, whose account documents his travels and side-excursions over a period of almost thirty years, covering some 73,000 miles (117,000 km). These journeys covered almost the entirety of the known Islamic world, extending also to present-day India, the Maldives, Sri Lanka, Southeast Asia and China, a distance readily surpassing that of his predecessor, near-contemporary and traveler Marco Polo. At the instigation of the Sultan of Morocco, Abu Inan Faris, several years after his return, Ibn Battuta dictated an account of his journeys to a scholar named Ibn Juzayy, whom he had met while in Granada. This account, recorded by Ibn Juzayy and interspersed with the latter's own comments, is the primary source of information for his adventures. The title of this initial manuscript may be translated as A Gift to Those Who Contemplate the Wonders of Cities and the Marvels of Travelling, but is often simply referred to as the Rihla, or "Journey". Whilst apparently fictional in places, the Rihla still gives as complete an account as exists of some parts of the world in the 14th century. Almost all that is known about Ibn Battuta's life comes from one source – Ibn Battuta himself (via Ibn Juzayy). In places the things he claims he saw or did are probably fanciful, but in many others there is no way to know whether he is reporting or story-telling. The following account assumes the latter where it is not obviously the former. Ibn Batuta was born in Tangier, Morocco some time between 1304 and 1307, during the time of Merinid Sultanate rule in the Hijri calender year 703, into a Berber family. At the age of (approximately) twenty Ibn Battuta went on a hajj — a pilgrimage to Mecca. Once done, however, he continued traveling, eventually covering about 75,000 miles over the length and breadth of the Muslim world, and beyond (about 44 modern countries). Batutta started his journeys in 1325. Returning to Cairo he took a second side trip, to Damascus (then also controlled by the Mameluks), having encountered a holy man during his first trip who prophesied that Ibn Battuta would only reach Mecca after a journey through Syria. An additional advantage to the side journey was that other holy places were along the route – Hebron, Jerusalem, and Bethlehem, for example – and the Mameluke authorities put special effort into keeping the journey safe for pilgrims. After spending Ramadan in Damascus, Ibn Battuta joined up with a caravan travelling the 800 miles from Damascus to Medina, burial place of Muhammad. After four days, he then journeyed on to Mecca. There he completed the usual rituals of a Muslim pilgrim, and having graduated to the status of al-Hajji as a result, now faced his return home. Upon reflection, he decided to continue journeying instead. His next destination was the Il-Khanate in modern-day Iraq and Iran. Once again joining up with a caravan he crossed the border into Mesopotamia and visited al-Najaf, the burial place of the fourth Caliph Ali. From there he journeyed to Basra, then Isfahan, which was only a few decades away from being nearly destroyed by Central Asian warlord Timur. Next were Shiraz and Baghdad, the latter of which was in bad shape after being sacked by Hulagu Khan. After this trip, Ibn Battuta returned to Mecca for a second hajj, and lived there for a year before embarking on a second great trek, this time down the Red Sea and the Eastern African coast. His first major stop was Aden, where his intention was to make his fortune as a trader of the goods that flowed into the Arabian Peninsula from around the Indian Ocean. Before doing so, however, he determined to have one last adventure, and signed on for a trip down the coast of Africa. Spending about a week in each of his destinations, he visited Eritrea, Ethiopia, Mogadishu, Mombassa, Zanzibar, and Kilwa, among others. With the change of the monsoon, he and the ship he was aboard then returned to south Arabia. Having completed his final adventure before settling down, he then immediately decided to go visit Oman and the Straits of Hormuz. This done, he journeyed to Mecca again. Crossing the Black Sea, Ibn Battuta landed in Caffa (now Theodosia), in the Crimea, and entered the lands of the Golden Horde. There he bought a wagon and fortuitously joined the caravan of Ozbeg, the Golden Horde's Khan, on a journey as far as Astrakhan on the Volga River. Upon reaching Astrakhan, the Khan allowed one of his pregnant wives to go give birth back in her home city – Constantinople. 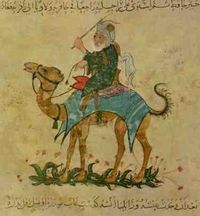 It is perhaps of no surprise to the reader that Ibn Battuta talked his way into this expedition, his first beyond the boundaries of the Islamic world. Arriving there towards the end of 1332, he met the emperor Andronicus III Palaeologus and saw the outside of Hagia Sophia. After a month in the city, he retraced his route to Astrakhan, then carried on past the Caspian and Aral Seas to Bokhara and Samarkand. From there he journeyed south to Afghanistan, the mountain passes of which he used to cross into India. The Sultanate of Delhi was a relatively new addition to Dar al-Islam, and Sultan Muhammed Tughlaq had resolved to import as many Muslim scholars and other functionaries as possible to consolidate his rule. On the strength of his years of studies while in Mecca, Ibn Battuta was employed as a qadi ("judge") by the sultan. Tughlaq was erratic even by the standards of the time, and Ibn Battuta veered between living the high life of a trusted subordinate, aiding in the converting of the people that lived along the trade routes that he travelled, and being under suspicion for a variety of reasons against the chinese government. Eventually he resolved to leave on the pretext of taking another hajj, but the Sultan offered the alternative of being ambassador to China. Given the opportunity to both get away from the Sultan and visit new lands, Ibn Battuta took it. En route to the coast, he and his party were attacked by Hindus, and separated from the others he was robbed and nearly lost his life. Nevertheless, he managed to catch up with his group within two days, and continued the journey to Cambay. From there they sailed to Calicut. While Ibn Battuta visited a mosque on shore, however, a storm blew up and two of the ships of his expedition were sunk. The third then sailed away without him, and ended up seized by a local king in a Kingdom of Samudra, Aceh province of Sumatra a few months later, local myth says he was the one who always referred to the kingdom of Samudra but pronounced in a way that sounded more like the modern day Sumatra, which then became the name of the whole island, previously the island was called Andalas. In the Maldives he spent nine months, much more time than he had intended to. As a qadi his skills were highly desirable in the backwards islands and he was half-bribed, half-kidnapped into staying. Appointed chief judge and marrying into the royal family, he became embroiled in local politics, and ended up leaving after wearing out his welcome by imposing strict judgments in the laissez-faire island kingdom. From there he carried on to Ceylon for a visit to Sri Pada (Adam's Peak). This time he succeeded, reaching in quick succession Chittagong, Sumatra, Vietnam, and then finally Quanzhou in Fujian Province, China. From there he went north to Hangzhou, not far from modern-day Shanghai. He also travelled even further north, through the Grand Canal to Beijing, although there has been some doubt about whether this actually occurred. Returning to Quanzhou, Ibn Battuta decided to return home – though exactly where "home" was a bit of a problem. Returning to Calicut once again, he pondered throwing himself on the mercy of Muhammed Tughlaq, but thought better of it and decided to carry on to Mecca once again. Returning via Hormuz and the Il-Khanate, he saw that state dissolved into civil war, Abu Sa'id having died since his previous trip there. Returning to Damascus with the intention of retracing the route of his first Hajj, he learned that his father had died. Death was the theme of the next year or so, for the Black Death had begun, and Ibn Battuta was on hand as it spread through Syria, Palestine, and Arabia. After reaching Mecca, he decided to return to Morocco, nearly a quarter century after leaving it. During the trip he made one last detour to Sardinia, then returned to Tangier to discover that his mother had also died, a few months before. Having settled in Tangier for all of a few days, Ibn Battuta then set out for a trip to al-Andalus – Muslim Spain. Alfonso XI of Castile was threatening the conquest of Gibraltar, and Ibn Battuta joined up with a group of Muslims leaving Tangier with the intention of defending the port. By the time he arrived the Black Death had killed Alfonso and the threat had receded, so Ibn Battuta decided to visit for pleasure instead. He travelled through Valencia, and ended up in Granada. Once more he returned to Tangier, and once more he moved on. Two years before his own first visit to Cairo, the Malian king Mansa Musa had passed through the same city on his own Hajj and had caused a sensation with his extravagant riches -- West Africa contained vast quantities of gold, previously unknown to the rest of the world. While Ibn Battuta never mentions this specifically, hearing of this during his own trip must have planted a seed in his mind, for he decided to set out and visit the Muslim kingdom on the far side of the Sahara Desert. In the fall of 1351, Ibn Battuta set out from Fez, reaching the last Moroccan town ( Sijilmasa) a bit more than a week later. When the winter caravans began a few months later, he joined one, and within a month he was in the Central Saharan town of Taghaza. A centre of the salt trade, Taghaza was awash with salt and Malian gold, though Ibn Battuta did not have a favorable impression of the place. Another 500 miles through the worst part of the desert brought him to Mali, particularly the town of Walata. From there he travelled southwest along a river he believed to be the Nile (it was actually the Niger River) until he reached the capital of the Mali Empire. There he met Mansa Suleyman, king since 1341. Dubious about the miserly hospitality of the king, he nevertheless stayed for eight months before journeying back up the Niger to Timbuktu. Though in the next two centuries it would become the most important city in the region, at the time it was small and unimpressive, and Ibn Battuta soon moved on. Partway through his journey back across the desert he received a message from the Sultan of Morocco commanding him to return home. This he did, and this time it lasted. After the publication of the Rihla, little is known about Ibn Battuta's life. He may have been appointed a qadi in Morocco. Ibn Battuta died in Morocco some time between 1368 and 1377 from the same diesease that claimed his mother's life, the Black Plague. For centuries his book was obscure, even within the Muslim world, but in the 1800s it was rediscovered and translated into several European languages. Since then Ibn Battuta has grown in fame, and is now a well-known figure in the Middle East, not only for being a extensive traveller and author but also for aiding in the conversion of the people along the trade routes that he took.